Yesterday I moved energy around. Today I moved two carloads of stuff around. Took the things to a friend who has a use for them. At least I hope she does, otherwise I’ve just used her as a dump. Of course, she’s also free to move the stuff around. It’s hers now. Someone used me as a means of moving energy/stuff around — she gave me her tarot cards and the book to help me interpret the meanings of my readings. I’m not really into tarot or any sort of divination for that matter. If we can change the future, then it doesn’t matter what the predicted future is, and if we can’t change it, it doesn’t matter either. Still, out of curiosity, I did a one-card tarot reading where you ask a question and the cards give you some sort of answer. Right before Jeff died, he told me things would come together for me. And recently, my publisher said he has a strong feeling things will work out for me. Of course, I’d like to know how they will work out. I mean, personal and financial successes are ways of things working out, but so is death. (That is how things work out for all of us in the end.) But I gave the cards a break and simply asked if things will come together for me. Knowing that sparkling potential waits for her, she takes a step. And it is not emptiness that meets her unhesitating foot, but sturdy rock and shale. She continues to walk, the bridge growing beneath her feet with every step. Wooo. Seems apropos, doesn’t it? And so much like an answer to my question. Just go, believe in the journey, and everything will come together when I need it. I’m not sure how much leadership one can express when one is alone at the end of bridge that is being dreamed into existence as one walks upon it, but otherwise, it’s exactly what I’ve been inviting myself to do — dream, explore, believe. 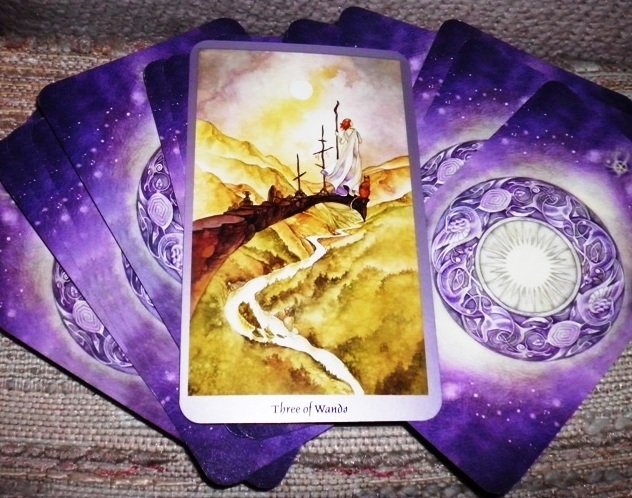 I’m learning Tarot myself, and I was taught the three of wands is supposed to indicate that an established project or something like it is on its way to completion. I wonder what that means for you. Maybe that I’m done with the past. What a beautiful set of cards, and a lovely interpretation! I agree! I might actually have to learn how to give readings so I have a use for such beautiful cards.